Ah, Kirby. Not only does he look like a marshmallow, he's probably as malleable as one. He suits any and all of HAL Laboratory's purposes, and keeps learning tricks! And I'm not talking about swallowing enemies and gaining their powers, here (he does none of that in this game). No. The pink hero who has previously been transformed into a pinball or had to roll around after having his limbs taken away, has now been split into 10, and has to team up with himselves to face the challenge ahead. The game is played solely with the touch screen. You start off with just the one Kirby, until you can eat enough fruit to create another one, and then another, and so on. Whether you have one Kirby or ten, you tap on the screen to move him, or double-tap to get him to run. Touch the enemies or flick your Kirbys at them to attack. You can also, with a prolonged touch in the middle of the pack, get them to latch on to your stylus and make them fly for a limited time. Don't expect tight platforming action in this game. With 10 Kirbys on the tiny DS touch screen, the levels had to be designed wide open to make sure you had the space necessary to move around and do your thing. There are no real puzzles in the game as it is always clear what you have to do: it's the execution that is challenging. Your time is spent mostly attacking enemies by swarming them. The more Kirbys are attacking, the faster the enemy will go down. But these enemies have means to counterattack, and so you cannot always be on the offensive. You have to know when to attack and when to retreat, otherwise your Kirbys might get stunned, and then crushed. In this respect, Kirby Mass Attack feels more like a small scale, 2D Pikmin game. Don't think that the game is one tedious string of fights in a row, however. The developer couldn't dazzle us with level design, so instead they went all out with set pieces and unique gimmick stages. Almost every level has its own hook that clearly differentiates it from the last, making sure you don't feel like you are always doing the same thing. There is also a need to explore each level, as there are many medals cleverly hidden. One unique Rainbow medal in each level is even required to access the last segment of the game: a boss rush, with the final boss waiting at the very end. One has to wonder what this padding is doing in an already meaty game. Kirby games have a reputation of being easy, and playing through the first of 4 worlds, you may be forgiven for thinking "Oh, you earn Gold Stars for not getting hit once in a level, that must be where the challenge lies, just like getting gold medals in Kirby's Epic Yarn was the real challenge in that game". But the game is no walk in the park: your Kirbys WILL get wiped out, and to the people attempting a perfect run, I can only say: "Good luck". I wonder if attempting it would not be more frustrating than challenging, however. I find "perfect runs" to be more enjoyable with short levels, but KMA's are quite long, and its boss battles can be ridiculously multi-tiered and convoluted. No "hit the weak spot three times" here. The variety that makes each level almost feel like its own mini-game and the cleverness of the hidden medals scream "great Nintendo design", which is why it would be a shame if fans should pass on it due to a lack of hype. The game manages to make its gimmick feel fresh far longer than could be expected, so put any fear of it getting old to rest. 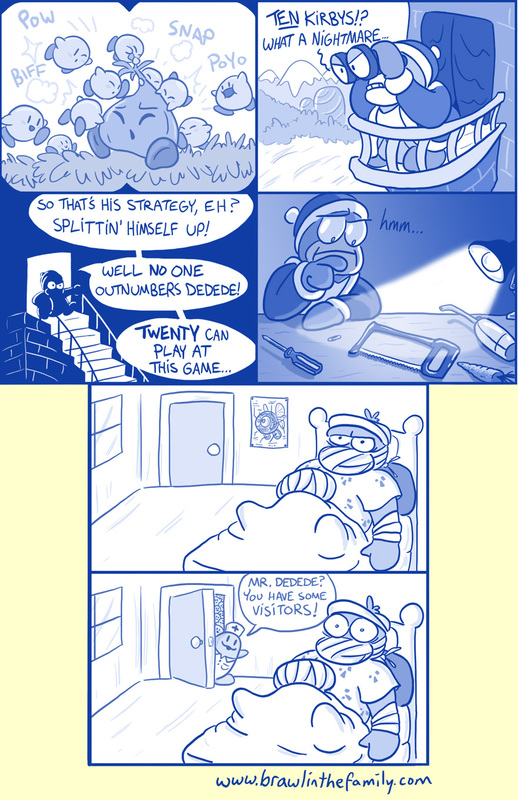 Kirby has never been a one-trick pony. I'm trying to remember what game it is where you get a whole bunch of little things and they all attack stuff. Maybe Pikmin? I don't think it's Pikmin. Whatever, Mass Attack sounds like the game I'm thinking of. I love that game! Good stuff, Gui. I will get this down the line, once that dang backlog gets itself worked out. Either that or Christmas. Definitely interested in the game. I'll probably pick it up in the coming weeks. I definitely want to play this. I loved the demo from the Wii Nintendo Channel, and Kirby games simply do not disappoint. It's truly remarkable the variety of games Kirby has appeared in, outside of the traditional Dream Land/ Adventure inhale-enemy-and-acquire-power stuff. I just can't get enough of the pink little guy! Great review, it sounds like this game also has the challenge I am looking for as a completionist kind of gamer as well. Excellent review, Guillaume! Also, I find it incredible how many ways they can "re-invent" Kirby, so-to-speak. I prefer the more traditional Kirby games myself, and even those have some sort of interesting mechanic added to them (I still wish Crystal Shards double-power-up system would return... some of those powers were so awesome - Fireworks Kirby!). Nice review. I'm glad that the levels have unique gimmicks. I'm totally excited about this game. Love the crazy Kirby stuff. I hope this sells well, since traditional Kirby games usually stomp the experimental ones, sales-wise. On a mildly related note, I guess that Mass Attack wasn't moved to the 3DS because it focuses on direct stylus control. I ordered Mass Attack from Best Buy over the weekend since it was 10% off (hey, every little bit helps!) and I had a gift card. It should be arriving today so I'm excited to play this over the weekend! My first DS game was Canvas Curse so it's fitting that possibly the last game I buy for the DS is another stylus controlled Kirby game. So your review worked... I hit Wal Mart tonight for some pop and came back with Mass Attack. WOO! Yesss. You guys won't regret it. This game is exactly what I needed for a pre-bedtime game. It's just so.... Fun. I am also impressed with the unlockable pinball game. You have to use your thumbs on the touchpad, but it feels great. Plus, it simulates multi-touch pretty easily because the flippers are so far apart from one another. Sure, tapping the middle of the screen will do it too, but hey! They got it to work so I applaud them. Great game that everyone should be playing right now. You can also use the L and R buttons for pinball! That.... Would be even better! Funny I didn't try that. Well, I unlocked the shooter, and I blasted through it without dying. It was pretty fun! The pinball and the shooter are solid extras for sure. Also, there is no way I will be attempting gold medals in all the levels. MAYBE silver. Maybe! Yeah, I've gotten a couple of gold medals in the first couple levels on my first try, but you're right -- it's going to be nearly impossible to never get hit. Finally got around to trying this out (rented it). The game's a gem for sure, and exceeded my expectations. It's probably about as good as Canvas Curse, which is a pretty big compliment in itself, but it feels even beefier in terms of length and stuff to do. It took me over three hours just to beat the first world, and I still have medals and stars to nab in those stages as well. The unlockables are solidly built and remind me a bit of Kirby Super Star's smaller games (especially the multi-level shooter and the pinball game, wow). There's clearly a lot of TLC put into the game and it shows, and it's actually quite a challenge to nab all the medals and stars. The controls are quite precise, but I do feel you get pretty vulnerable once you have over 5 or so Kirbys. It seems that tapping to run from an obstacle or attack almost always leaves one or two Kirbys lagging behind the string of them, and they end up ruining your chances for a gold star. I wish they could auto-leap some of the ledges a little better too. That aside, the controls work surprisingly well and do feel a lot like Pikmin (or even more accurately--Little King's Story). I look forward to playing more, and nice review! Since KMA wasn't replaced by Aliens in my DSi XL like I thought it would be, I've actually been going back and Gold-Starring every level. The first two worlds are done, and you know what? It was actually pretty fun. But world 3, not so much. It's taking more and more tries to get it right as the levels get harder, predictably. But there is also this one level (7, I believe? With the water levels that keeps going up and down?) that has been simply infuriating, and at this point, after a dozen tries, it's not much fun anymore. I probably should skip it and come back later. One thing this game is lacking is checkpoints. There's a fairly long level in world 3 where I got to the end level boss, immediately lost all of my 10 Kirbys and now have to do it all over again. Screw that! I streetpassed someone who had been playing Kirby Mass Attack, yesterday. I want to play this, but it's a gift for my girlfriend and I'll let her have at it first.